"Barons Court" redirects here. For the constituency, see Barons Court (UK Parliament constituency). Barons Court is a London Underground station in West Kensington of the London Borough of Hammersmith and Fulham, Greater London. This station serves the District line and the Piccadilly line. Barons Court is between West Kensington and Hammersmith on the District line, and between Earl's Court and Hammersmith on the Piccadilly line and is in Travelcard Zone 2. East of the station, the Piccadilly line descends into tunnel towards Earl's Court and the District line continues in a cutting to West Kensington. The station is the last open air stop for eastbound trains on the Piccadilly line until Arnos Grove and has cross-platform interchange with the District line. The station is in a deep brick sided cutting. The station is located on Gliddon Road, a short distance from Talgarth Road (A4). East of the station, the Piccadilly line descends into tunnel towards Earl's Court and the District line continues on the surface to West Kensington. The station in May 1962 looking east with a westbound Piccadilly line train to Uxbridge. 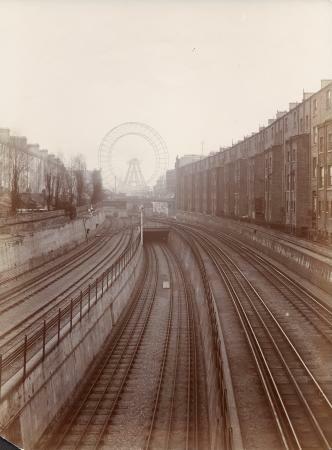 The tracks through Barons Court were first opened on 9 September 1874 when the District Railway (DR, now the District line) opened an extension from Earl's Court to Hammersmith. 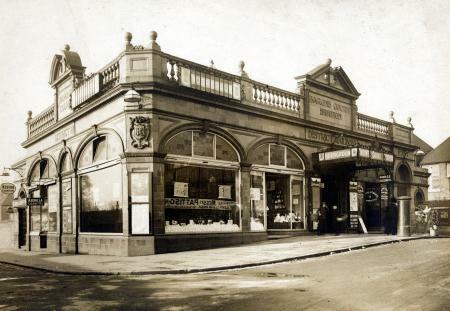 When the line was constructed the area now known as Barons Court was open fields and market gardens to the west of the settlement of North End and there was no call for a station between West Kensington and Hammersmith. However, by the beginning of the 20th century, the area had been developed for housing and, on 9 October 1905, the District Railway (DR) opened the station to serve these new developments and in preparation for the opening of the Great Northern, Piccadilly and Brompton Railway (GNP&BR, now the Piccadilly line), then under construction. The GNP&BR began operations on 15 December 1906, running between Hammersmith and Finsbury Park. The former Formula One driver B. Bira, who was a member of the Thai Royal family, was found dead at the station in December 1985. The unique bench on the eastbound island platform. 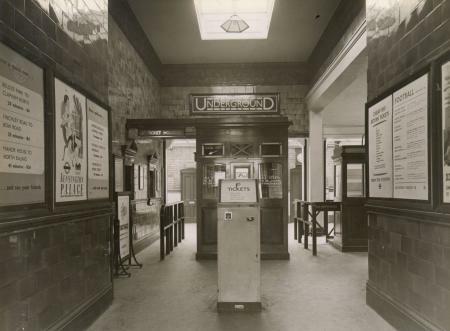 The station building was constructed to a design by Harry Ford in a style similar to that used at Earl's Court and Hammersmith and is now a Grade II listed building as it retains many of its original features, including terracotta facing and Art Nouveau lettering. The wooden benches on the platform with the station name along the back on enamelled metal panels are a unique feature on the entire London Underground. The station has two island platforms to provide an interchange between the two lines - the inner pair of tracks is used by the Piccadilly line and the outer tracks by the District line. The station building has been Grade II listed since 14 February 1985. Many people mistakenly believe that name Barons Court is inspired by Earl's Court to the east and the association of the area in the early 19th century with the Margrave of Brandenburg-Ansbach (died 1806) and his English wife Elizabeth (the Margravine, the widow of the 6th Baron Craven). They had a home at Brandenburg House immediately to the west of the site of Charing Cross Hospital. The Margravine died in 1828 and is commemorated by a number of roads in the area (Margravine Road and Margravine Gardens) and the Margrave possibly by Barons Court Road although the approximate equivalent rank in the British peerage to Margrave is a Marquess. The name Barons Court is probably inspired by the Barenscourt estate in Ireland, where Sir William Palliser, who built the entire area, had connections. As well as Palliser Road itself, all the roads in the area are named after members of his family. The platforms at Barons Court. Sir William's brother, John Palliser (the explorer) inherited the Comeragh estate in County Waterford. Sir William did not have an Irish estate of his own. Instead, he tried to develop this London estate. He died very suddenly on 4 February 1882, and the lawyers had a field day, selling everything off, including the 11 acres (45,000 m2) which would become the Queen's Club. Sir William was heavily in debt, though if he had not died so suddenly and had managed to sell many of the houses he could have been a wealthy man. As it was, the family ended up with nothing. Some wonder if there is a reason why the apostrophe is not used for Barons Court station but is used at the nearby Earl's Court. A book in the Society of Genealogists, annotated in pencil by R. Burnet Morris who knew Sir William personally, provides a history of the area. Morris declared Barons Court was named "after Sir William's Irish Estates" namely "Barenscourt". As a result, unlike Earl's Court station, Barons Court is written without an apostrophe. A 1973 stock Piccadilly line train stands at the eastbound platform. There is also a morning service every day from Acton Town (Ealing Broadway on Saturdays) to Edgware Road and a late evening service from Edgware Road to Ealing Broadway on Sundays only. Ealing, Hammersmith and West London College's Hammersmith site is across Talgarth Road on Gliddon Road. The Queen's Club, location of the Aegon Championships tennis tournament, is at the end of Palliser Road. The London Academy of Music and Dramatic Art, (LAMDA), is on the Talgarth Road. Charing Cross Hospital is nearby, and is advertised at the station exit. ^ a b Historic England. "Barons Court Underground Station (1358562)". National Heritage List for England. Retrieved 27 July 2016. ^ "Barons Court tube station". Google Maps. Retrieved 1 June 2015. ^ a b c d e f g h i j Feather, Clive. "Piccadilly line". Clive's Underground Line Guides. Archived from the original on 1 June 2015. Retrieved 1 June 2015. ^ a b c d e f g Feather, Clive. "District line". Clive's Underground Line Guides. Archived from the original on 1 June 2015. Retrieved 1 June 2015. ^ "The Prince And I: The story of the last Thai F1 driver". BBC. Retrieved 29 November 2018. ^ "Lady Elizabeth Berkeley". The Peerage. Archived from the original on 31 January 2009. ^ "London 1994 - Incident on the Tube". Just for my boys. 9 November 2011. Archived from the original on 23 March 2012. ^ "District line timetable: From Barons Court Underground Station to West Kensington Underground Station". Transport for London. Retrieved 1 June 2015. ^ a b "District line timetable: From Barons Court Underground Station to Hammersmith (Dist&Picc Line) Underground Station". Transport for London. Retrieved 1 June 2015. ^ a b "Piccadilly line timetable: From Barons Court Underground Station to Earl's Court Underground Station". Transport for London. Retrieved 1 June 2015. ^ a b c d e "Piccadilly line timetable: From Barons Court Underground Station to Hammersmith (Dist&Picc Line) Underground Station". Transport for London. Retrieved 1 June 2015. Wikimedia Commons has media related to Barons Court tube station. "Barons Court". Photographic Archive. London Transport Museum. Archived from the original on 9 February 2014. Entrance to GNP&BR tunnel between District Railway tracks, 1906. In the distance can be seen the Great Ferris wheel at Earl's Court exhibition ground.